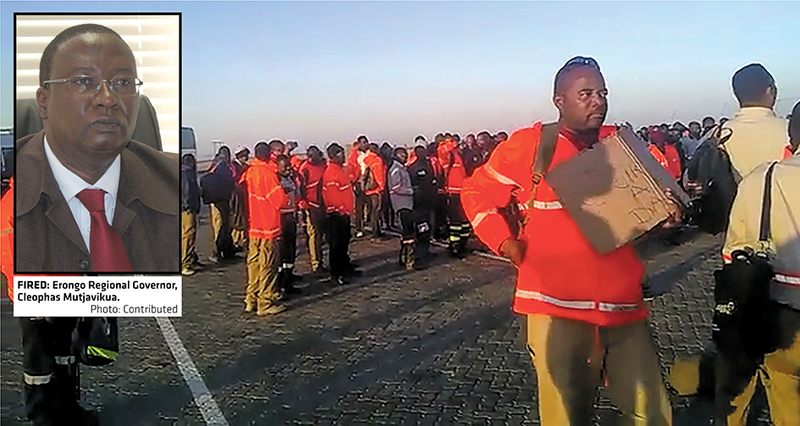 THE negotiations of workers conditions at the Husab-mine landed unions, political employees and the President of Namibia on a collision course after a debacle erupted around the Erongo Regional Governor and the top management of Chinese owned Swakop Uranium. The secretary-general of the National Union of Namibian Workers, Job Muniaro, not only demanded that Erongo Regional Governor, Cleophas Mutjavikua, be fired from his position, but he accused him of betraying the workers and the Namibian President in an election year. Voice recordings of a series of meetings between Mutjavikua and the top management of Swakop Uranium, allegedly made without the knowledge of the parties involved, is at the centre of the debacle that exposed the vulnerability of workers from all over Namibia. The Swapo workers’ federation secretary-general said that the recording confirms his allegations that there is no truth in any communication about retrenchment in Namibia. Muniaro said that the manipulation of workers is achieved by lying to them about the economy, finances, safety and the downward spiral of commodity prices. The series of meetings between Mutjavikua and Swakop Uranium centered on the possible restructuring of the company and included discussions about a pay and benefit cut for workers. In an official statement released by the regional governor, he flatly denies that he ever mentioned the words ‘retrenchments’ and ‘job losses’ or that he advised the company to retrench workers. Mutjavikua claimed that he only acted as a mediator. “Indeed I referred to re-organising clause in the labour Act on a question relating to systems and processes which the Company wanted to be addressed. The issue of processes and systems became a sticking point in negotiations as the mine insisted on linking half of the annual salary increases on the performance of the company,” he said. “My advice to the Company was that there is a recognition agreement, that is only referring to an annual substantive negotiation, but not the linking of annual salary increases to the performance of the company. In addition, the management was referring to a three years substantive agreement that is an arrangement totally contrary to the recognition agreement. In the wake of the fall out, Swakop Uranium fired off an official statement as well and in it the Vice President of the company, Percy McCalum, condemns the secret recording of the consultative meetings and threatened the party responsible with possible legal action. “Wage negotiations between Swakop Uranium and Mine Workers Union of Namibia commenced on 15 October 2018. It was then agreed by both parties to invite the Honourable Governor to act as mediator on the differences of wages between the two parties on 18 and 19 February 2019. During the two days of mediation, tremendous progress was made between the two parties and the Honourable Governor, as mediator, insisted on the Company to make compromises to ensure a speedy and acceptable wage agreement for Swakop Uranium employees,” the Swakop Uranium statement said. 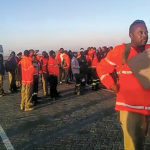 The debate that ensued on social media platforms in the wake of the explosive exposure also brought the governor’s involvement in the large scale retrenchment that followed the closure of the Langer Heinrich Mine into question.